Mr. G's musings: NEW YORK to LONDON in 1 hour: perhaps there is hope for our future? NEW YORK to LONDON in 1 hour: perhaps there is hope for our future? 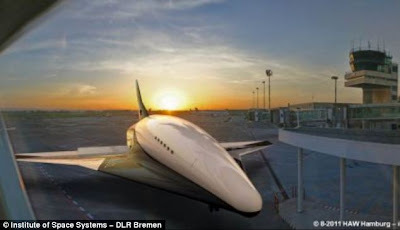 A German company, German Aerospace Center, has announced plans for a new hypersonic airplane, the SpaceLiner, which would fly at 24 the speed of sound, capable of flying to New York from London in one hour or from London to Sydney in one and half hour. This vehicle that they are proposing would carry 50 passengers and would include both a rocket lift into space to 50 miles above earth and a glide back to earth ending in a typical airplane landing on a runway. One of the saddest things about last century was the fact that mankind created a miraculous supersonic aircraft (the SST and the Tupelov) in 1973 by the next century no such technology was being used at the beginning of the twenty-first century. The Concorde fleet were retired with no replacement. This beautiful aircraft started commercial airline service in 1976 and the entire fleet was retired following a crash of a Concorde at Paris' Orly airport and downturn in airline travel as a result of the 9/11 terrorist attacks against the US. In my opinion, it is a tragedy that, whilst mankind created such an amazing aircraft like the Concorde, that we were not capable of continuing the evolution of this type of aircraft after 27 years of commercial service. Or after it's retirement in 2003 (a decade ago no SST flies). There have been many proposals throughout the years for supersonic aircraft. But nothing had traction enough to be the successor to the beautiful and astonishing Concorde. For almost thirty years humankind flew from New York to Paris in approximately 3.5 hours. But since 2003 we've gone back to the horse and buggy in airline service, so to speak. I guess cell phones and I-pads, computers, etc were a more important evolutionary moment for our pathetic species? Somehow they seem rather small and lame next to the accomplishment of space exploration or supersonic flight. Let's hope that we begin to aspire to a more noble and higher aspirations. Not until Republicans die out though.